You occasionally read about banks’ pitches to take hot companies public, and they are often cringe-worthy: Bankers wore band t-shirts to pitch Pandora, and UBS dressed “around 75 of its employees in Lululemon gear and had them descend upon Central Park for a ‘flash mob’ yoga session” to pitch Lululemon for some reason. 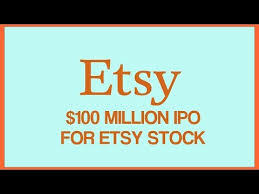 What do you think Goldman Sachs, Morgan Stanley and Allen & Company did to win the Etsy initial public offering? Did they hand-write the pitchbooks in fountain pen? Crochet them? Or just produce them normally in PowerPoint on their computers, but they were wooden computers? Did everyone else know about this? The company was founded by Rob Kalin, a carpenter making handmade wooden computers with nowhere to sell them. This entry was tagged brokerdealer.com blog, brokerdealers, Etsy IPO, Etsy.com, Goldman Sachs, hot IPOs, initial-public-offering, investment bankers, IPO, Morgan Stanley and Allen & Company, pre-money valuation, preliminary prospectus, Rob Kali. Bookmark the permalink.